When it came time to prepare my new year greeting print this year, I did the same thing as I did last year, and selected a design that would give me good practice at some traditional carving! My own recent prints have not used many outlines, and as I really don't want to lose my hard-won ability to make ukiyo-e prints, I chose a design that would give me a good workout! The main story in this issue of our newsletter is the continuation of the 'script' for the imaginary documentary on my work that we began in the previous issue. This time, we focus on a step-by-step view of how one of my prints is made. We also have another in the occasional series of 'Visit' stories. This time we'll try something different – we'll drop in on a westerner living in Japan for many years and making prints using an old and antiquated technique. Eh? Have you ever heard of such a thing?! We'll wrap up in the usual way, with Sadako's Corner. I hope you can find something of interest in this issue! [Camera] The tip of a black brush, drawing a delicate line on thin translucent gampi paper. David is tracing the hanshita, working over a light table in a darkened room. 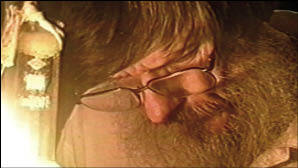 This thin paper is taped over an enlargement of an image of the Edo-era print he is reproducing, and light shines up through the paper onto his face. [Narration] This is where the process of producing a traditional Japanese woodblock print begins - with the lines of the design being committed to paper. The print we are going to watch come to life is a reproduction of an Edo-period design, a 'surimono' print originally published in the 1840's. [David (voice over)] [Camera continues to show the tracing work, along with interspersed shots that match his comments] "In the old days, the master copy of the design that would be used to guide the carving - the hanshita - would have been prepared by a specialist craftsman, one highly skilled in using the traditional brush. He took the design supplied by the artist, which was sometimes in very rough sketch form, and 'translated' it into something with clearly defined lines more suitable for carving. "My skill with a brush falls far short of what they could produce of course. So I do this job using a greatly enlarged image of the source image, one that allows me to see every tiny detail. Once I have finished tracing all of the original design, I have this mechanically reduced back down to the original scale, again onto this most delicate and strong paper - hand-made gampi. This is the only part of the process in which I use the assistance of modern technology - from this point right to the end, I will be working with the same tools used by the craftsmen who produced the Edo-era print." [Camera] Closeup of the completed hanshita, perhaps with a scale laid on top. The lines are delicate beyond belief, and the viewers have to be asking themselves, "How can this possibly be carved?" We then move to the next step - pasting this hanshita onto the wood. 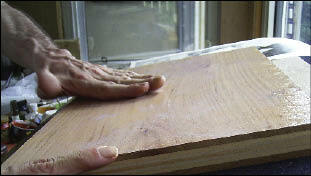 David is at his carving bench, blank block before him. He talks about the procedure as we watch him do it. [David] "The wood is yamazakura - the mountain cherry. There is absolutely no other wood that is more suitable. Some are too hard, and don't allow the moisture in the pigment to be properly absorbed. Other woods are too soft, and the carved lines soon break down. This one offers the perfect balance; when you have a fine piece of this cherry, beautifully fine lines can be carved, and clean colours can be printed. And if you take good care of the carved block, many copies of the print can be made, far more indeed than with many metal plates." [Narration - as David continues to work] In the old days, pasting this delicate sheet onto the surface of the wood was a job for only the most experienced men, as any small distortion at this point would be carried into the final print. ... The hanshita is pasted onto the wood face down. 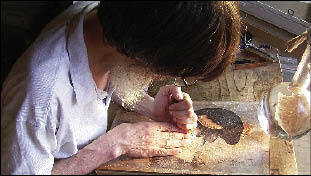 As the sheet begins to dry, David uses his fingers to peel away the paper fibre by fibre, leaving the design clearly visible on the surface of the wood. [Narration] Carving this block will take David about 5 days. He will sit here at this bench, face bent close to the wood, for many hours each day. By his side is a wooden bucket, on top of which sit some of his sharpening stones, which he will use many times each day, to keep a keen edge on the blades of his carving tools. [David (voice over during carving)] "These knives are such a pleasure to use. Each blade is made from pieces of steel hammered together in just the same way that Japanese swords are made - with an extremely hard (but brittle) layer for the sharp edge, laminated to a softer steel for strength. When you look closely at the edge of the knife, you can see these double layers, just as you can with fine swords. I am certainly not a 'samurai', but I use a very similar tool!" [Narration - as camera slowly pans closeup over finished keyblock] This is the 'key block', which will be used to print the outlines of the design. This would be a work of art in its own right, but is just one step along the way to creating the finished print. [David] "This block is now done, but as this will be a multi-coloured print, we need more blocks. 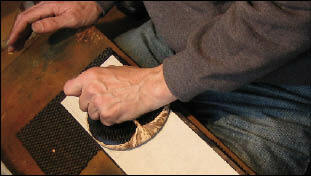 And the Edo-period craftsmen came up with a wonderfully simple method of getting everything to fit together. Look down here at one corner of the block - there is a notch carved into the wood. And over here - there is another. Later, once I start printing, the paper will fit snugly into these notches, allowing perfect registration." [Narration] David now uses his printing tools and a special smooth paper, and takes a number of proof impressions of the carved block. He then uses these sheets to analyze how the design will be broken down into its component colours. For example, this sheet indicates the areas that will be required to print the kimono colour ... this sheet for the background. One sheet for each colour. [David] "Because this time I am making a reproduction, I have a clear model to follow at this stage. But when you are making an original, all this colour separation takes place in your mind. You have to imagine what the final result will be." [Narration] Here is the complete set of colour separations for this print. These are now pasted down onto fresh blocks, and carving begins again. [David] "See how the registration marks have been accurately transferred to this block; these notches match those on the keyblock exactly! What a wonderful system! [David continues speaking during scenes of the carving ...] "Back in the old days, prints like these were made with teams of craftsmen; the most experienced men would do the most important parts - things like the faces, or delicate calligraphy. Less capable men would handle the 'rougher' parts of the work. The blocks would be passed around the shop as the work progressed. Can you imagine how noisy it must have been in some of the larger workshops, with many men hammering away on the blocks?! "In my case of course, I do everything myself, so I can sometimes imagine that I am a young apprentice, and sometimes I become the 'old master carver'!" 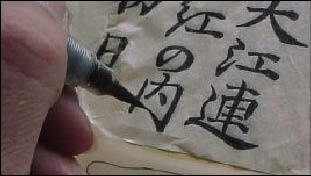 [Narration] In the Edo period, carving and printing were always done by different men, but David does both jobs. 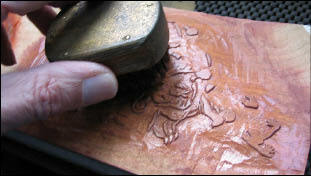 Once the set of blocks is ready, David must clean up all his carving tools, and prepare his printing bench. [David speaks as we watch him prepare the tools] "Doing both jobs is of course something that I take a great deal of pride in, but I don't know if it really is such a good idea. An old carver said to me one day, "If you would quit fooling around with printing, you could become a really good carver," and I suppose he was right. But it can't be helped - I want to do it all by myself!" [Narration] Traditional Japanese printers use only a very limited number of base pigments. To create the green colour needed in this print, David will mix indigo and yellow, adding some sumi as needed. [David - face to camera] "This is a very important point about our work. The colours you see in a traditional Japanese print aren't bought off the shelf in a shop, they are created by the printers themselves. Look at this photo of a colour separation sheet that was used in the preparation of an Utamaro print back in the Edo era. We can clearly read Utamaro's instructions to the printers: 'purple' 'green' 'yellow'. But this means nothing. What kind of purple? There are a thousand different purples possible! "It was up to the printers to create a good balance among all these tones, and the best printers could produce masterpieces! I myself still struggle with this sometimes, but I am gradually getting better at it." [Narration - as David uses a wide brush to moisten his printing paper] The paper David uses for making all his prints is the famous Echizen hosho. There are now only a few households left producing this paper, and this is one of David's greatest worries. [David] "There are many different kinds of washi produced all over Japan, but only one is suitable for this kind of printmaking. It is made in Imadate-machi, a small village in the snow country region of Japan, a place that has been supplying this paper for hundreds of years. Most of the well-known ukiyo-e prints from Edo times were created on this same paper, made in that same village. Many dozens of workshops once produced it, but only a few still continue. This paper is the very heart and soul of Japanese printmaking, and if I were to lose it - if there were no more suppliers - my own work would come to an immediate end. There are no alternatives." [Camera] David now proceeds to use the blocks and pigments to produce a single copy of the print, as we watch. Because this will take some time, the camera goes 'fast forward' between some of the steps, and slows to a normal pace to show the main elements of the process. In one corner of the screen, we see the image building up stage by stage until is it finally complete. [David (speaks to camera)] "There is our finished print, and as you saw, every colour on the sheet had to be printed separately. Imagine then, the kind of work it takes to produce a pile of 200 copies of such a print. It sounds like the most inefficient system that could possibly be devised! "But do you know, it is no such thing! It took me 9 days to carve the blocks for this print - five days for the keyblock and another four days for the colour blocks. I am now ready to set to work to produce 200 copies of it, and this should take me about 12 days. 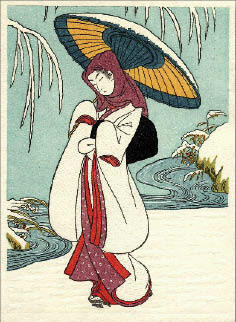 So, after a total of 21 days of peaceful work, I will have a stack of 200 beautiful woodblock prints. They are made on one of the finest papers on this planet, and they will last hundreds of years. "For every one of these 200 sheets - hundreds of years of pleasure, for generations of people yet unborn, all for my 'investment' of 21 days of work. "Inefficient? I wish every 21 days of my life could be spent so usefully!" The images accompanying this story will of course at first glance look to you like photographs, and photography is indeed the first step in the creation of Peter's work. But only the first step. The image that he sees in the viewfinder of his camera provides the 'seed' from which he will produce the final print. 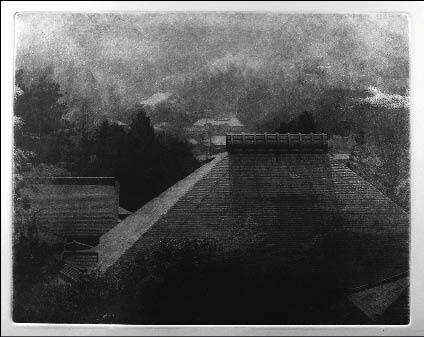 The process he uses is photogravure, an etching technique which dates from the era of the earliest photography. In a basic single-sentence description: the image from a camera is used with light-sensitive 'resist' materials to produce an etched copper plate from which prints can be made on a press. But such a simplistic description of course hides a universe of detail and complexity (just as with my own woodblock printmaking) and it is from this detail that Peter pulls his art. How deep to make the blacks? How much contrast between various tones? What tints to mix into the ink? He has an infinite range of variables that must be adjusted before a successful print can be pulled. And as he is pulling the prints one by one, in a far more labour-intensive process than my own printing, the image continues to develop. Early prints may have a 'bolder' appearance, but as the edition progresses, things are changing - the etched copper is transforming under the wiping and printing process, tending to give the print a softer appearance, and the man doing the printing is learning more about the possibilities inherent in the image. It would be an exaggeration to imply that he is 'painting' each print as he inks and wipes the plate, but not completely! It is a tremendously complicated process, but the results - beautifully three-dimensional deeply saturated images - well repay the effort. 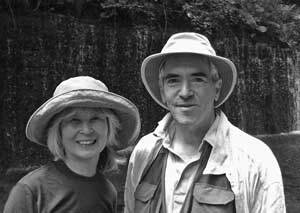 Peter lives with his wife Yuko-san in a house/studio they own in the hills of Kamakura. Although he has been here in Japan even longer than I have, we had never met, only corresponding via email. So on the day that Sadako and I visited, they took us for a short tramp in the nearby woods, and we began to get acquainted with each other. In a pattern very similar to my own, Peter had no idea - nor intention - that he would ever end up as an artist; his education and earlier employment were in other fields. But - in his words - "a chance acquaintance with the many uses of ultraviolet light ... in semiconductor wafers, printed circuit boards, fast-drying commercial inks, glues, optical fiber - and photogravure ..." planted the seed for what was to come. And then, upon seeing an exhibition of photogravures from the 19th century, the seed was nurtured, and grew into the desire to learn how to make them himself. Did he know how? No. Did he have a teacher? No. In a sentence from his website - and which could probably be reproduced verbatim from my own - he says he learned by, "... researching historical sources, acquiring materials, and experimenting by trial-and-error, mostly error!" Well, the days of 'error' seem mostly behind him now, and that afternoon, Sadako and I sat in his studio as he showed us a selection from the hundreds of prints that he has produced since those early days. 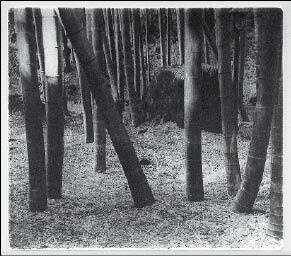 His earliest prints were of scenes that he discovered in his immediate environment - the temples and landscapes of Kamakura - but since then he has found his subjects in more distant places: Mongolia, Scandinavia, and - most spectacularly - the foothills of the Himalayas in Nepal. Along with the knowledge of photogravure that Peter has acquired, has come the sense that he has a responsibility to see that this knowledge is passed on to others; his website contains a great deal of information on the 'how to' of his craft and art. He shares this with me - the feeling that there is no 'competition' between printmakers like ourselves, and that the more who try it, and the more who become proficient at it, the better off we will all be. He and I traded 'war stories' from our exhibitions - sharing a similar frustration about how difficult it sometimes is to bring people to understand just what it is we are doing. Putting our prints 'on the market' is not enough; we must both try as hard as we can to communicate our enthusiasm to others, for it is only through such communication that we will be able to create this understanding. He told me of a day some time ago when he was approached by a young woman at one of his exhibitions, who - after hearing an explanation of the long and complicated photogravure process - asked him, "Why do you do this?" I think she must indeed have been young - perhaps too young to understand that there is no process too complex, no challenge too long and difficult, no mountain too high to climb ... to stop a man who is on a quest for an ultimate beauty. Is that a bit too melodramatic? Maybe. But that doesn't make it any less true! Thanks for the friendship Peter, and for the example you provide for us all! Peter's website - containing hundreds of images, along with much material explaning his work - is here. The past few days have been filled with sweat-soaked heavy garden work, pulling out plants and trees - all of which I myself had carefully planted and nurtured! These were plants that I had searched for, planted and had taken great care of day after day. As the work goes on, my irritation grows, "What a fool I am! I'm so busy, aren't I? Planting, pulling, planting, pulling ... Oops! I pulled the wrong one - that one I want to keep!" Let me explain. This shrub, for example, that I pulled out the other day - it is a vine type hydrangea that I first saw many years ago in a famous garden in Europe growing on the brick wall of a castle. Back in Japan I searched for a similar plant, and was finally able to obtain a tiny seedling. I planted it on the west side of my weather-beaten storage room and dreamed of the day when the entire wall would be covered by the greenery. The area of wall is only about 2 square meters, and the plant grew slowly. But when around 5 years had passed the plant started growing wildly, stretching its vines in every direction. Some sneaked between planks of the wall and invaded the storage room, some stretched out into the yard, and even started new roots wherever it touched the earth. The green vines gradually turned into fat brown branches and even invaded the property next door. It reminded me of the rose in the "Sleeping Beauty" movie, and was quite scary. Over and above these troubles, the flowers, which finally bloomed after about six years, were small and unattractive! I had managed to keep it generally under control, but its power was so enormous that I finally gave up, and decided to be done with it. It was very hard work, ripping the thick vines from the wall, and chopping it all into small pieces, but I was finally able to get rid of it. Another example is the ground cover in my garden. Japanese gardening traditionally appreciates clean-looking earth, and the area around a tree is usually swept clear and clean. I myself had always considered this to be the normal practice, and had been a bit shocked one day to hear somebody say "Why do you have so much bare dirt exposed?" Now this is just a different point of view, but it did make me think about those gardens in Eupore that had no exposed soil. So I began to look for species that would grow in deep shade, and planted them in these areas. I whispered "Grow quickly!" to them, and spent much time on their care. That was a few years ago, and most of the bare soil in my garden has become covered with green. The results were pleasing, but the other day I realized that something was wrong; many plants have disappeared - invaded by the ground cover! And so began another fight! "Who planted all this stuff? It has covered everything!" I mumbled while wielding my sickle. As this clearing work has progressed, my garden has become stark and bare, but in my mind I can clearly imagine the spring views, "That tree will be moved over here; this area will be grassy ..."
Is this silly? The older I get, the more I come to think that this is the way we live. Isn't it? Although I made the announcement in the previous newsletter that there will be no exhibition this winter, a number of the collectors still wrote on their New Year Card, "Looking forward to seeing you at the exhibition!" All I can do at this point is repeat the announcement here in this issue, apologize for breaking the 'pattern' after nearly twenty years in a row, and ask everybody to please be patient until I finish the current series and then try to organize some kind of a show to put them on display. Believe me, I want it as much as you do!